Mars, the world’s leading chocolate company and one of the largest food manufacturers, has a unique perspective on the impact that exascale computing will have on the food industry. “The food industry needs to address several grand challenges by developing innovative and sustainable solutions at the intersection of food, agriculture, and health. Leveraging the power of technology will be critical on this journey. Exascale, for example, is going to be a radical enabler for helping the food, nutrition, and agriculture sectors to evolve and possibly even revolutionize themselves to address these grand challenges,” said Harold Schmitz, chief science officer for Mars and director of the Mars Advanced Research Institute. Schmitz is a member of the US Department of Energy’s (DOE’s) Exascale Computing Project Industry Council, a group of external advisors from some of the most prominent companies in the United States. The Exascale Computing Project represents the next frontier in computing. An exascale ecosystem, expected in the 2021 time frame, will provide computational and data analysis performance at least 50 times more powerful than the fastest supercomputers in use today, and will maximize the benefits of high-performance computing (HPC) for many industries. In the case of the food industry, exascale will offer new solutions that can improve food manufacturing practices, yielding safer and more healthful products, more efficient industrial processes, and a reduced carbon footprint. “The power of exascale has the potential to advance the work of a first-of-its-kind effort led by Mars and the IBM Research–Almaden Lab, called the Consortium for Sequencing the Food Supply Chain,” Schmitz said. The consortium is centered on surveillance, risk assessment, and diagnoses of food-borne pathogens, and it is one of the few efforts in the world using the best tools of genomics, biology, and chemistry to understand nutrition, public health, and food safety. “Although food safety has progressed immensely over the last hundred years—most notably through improvements in shelf life and the addition of macronutrients for preventive health—it remains a major challenge for food manufacturers,” Schmitz said. One in six Americans suffers a food-borne illness each year, and 3,000 of those affected die, according to the US Centers for Disease Control. Across the globe, almost 1 in 10 people fall ill every year from eating contaminated food and 420,000 perish as a result, reports the World Health Organization. Increased industry and regulatory attention on pathogens such as Salmonella, Campylobacter, Listeria, and aflatoxin has led to breakthroughs that make our food safer, but more must be done. Scientists need a method by which they can understand the pathogens in various contexts, including the microbial community, the microbiome, and the broader food chain. Going one step further, they need a method that enables them to anticipate how the pathogen would behave in real scenarios, such as: a field where crops are grown and harvested; during travel on various transportation channels; or in factory environments where ingredients are processed. Mars has used genome sequencing to progress its efforts to improve the supply-chain sustainability of one of its key ingredients: cocoa. It is a low-yield crop grown primarily in countries that lack the scientific and technological resources to modernize it. “We realized we needed to give the most talented agricultural scientists a tool box to make the cocoa crop sustainable,” Schmitz said. That tool box is the genome. So, from 2008 to 2010, Mars, IBM, and the US Department of Agriculture Research Service, and several other collaborators sequenced the genome of Theobroma cacao, an economically important tropical fruiting tree that is the source of chocolate. He explained that exascale will provide food data scientists with an unprecedented level of computing power to probe molecular food chemistry in a manner akin to how the pharmaceutical industry uses technology to study protein molecular dynamics. 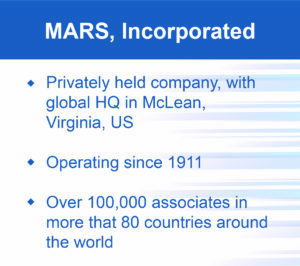 The HPC teams at Mars, which partner with DOE National Laboratories to bolster their computational science efforts, use modeling and simulation and data analytics to optimize not only the company’s supply-chain processes but also its design manufacturing processes. The teams employ tools such as computational fluid dynamics, discrete element method, and multiphysics-type deterministic models in HPC. “We’re applying multiphysics models to better understand some of our essential processes such as extrusion,” Kennedy said. Extrusion is a fundamental process in which product ingredients are fed into a barrel and forced through a screw. The functions of mixing, sterilization, or cooking may take place in the barrel. Mars products such as confection candy, toffee candy, and pet food undergo extrusion. Exascale will enable the food industry to pioneer more efficient manufacturing processes that use less energy, in turn lessening its environmental impact. “The advent of exascale will help spread the use of data science more widely,” Kennedy said. At present, most companies are facing a shortage of data scientists while the need for digitization is expanding. At the same time, companies are trying to automate some of the tasks that would normally require a data scientist, such as cleaning, normalizing, or preprocessing data for analysis, simulation, or modeling. Mars recently confirmed a collaboration agreement with the Joint Institute for Computational Sciences, an Institute of the University of Tennessee and Oak Ridge National Lab. The business plans to leverage the DOE and the university computational infrastructure to find solutions for some of its most complex challenges and opportunities.